A giant thank you to our February author, Alison Goodman, who has selected this month’s title for bookclub: I hope you’ll join me in saying a big ‘YAY!’ for our March title, Notes from the Teenage Underground by Simmone Howell. Notes was first published in 2007, which almost makes it an Australian YA classic – it was released only a year after Twilight took the world by storm, so it really was one of the New Wave of contemporary Aussie YA books that emerged as YA was finding its market strength. It launched the career of one of our favourite and most respected YA authors, the gorgeous Simmone Howell, with a story of best friends, summer rebellion, and Andy Warhol. 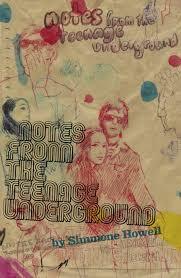 So I do hope you enjoy Notes from the Teenage Underground – you can, of course, order the book through Boomerang Books, and use the promotion code ‘loveoz‘ to get free shipping. And if you see Simmone around the traps, tell her I said hi!